This trail through the 2,000 acre Webb Forest provides guide sheets describing the beneficial long-term forestry practices identified by signs along the trail. An interpretive brochure is available here and at the entrance to the Wolf Tree Trail. 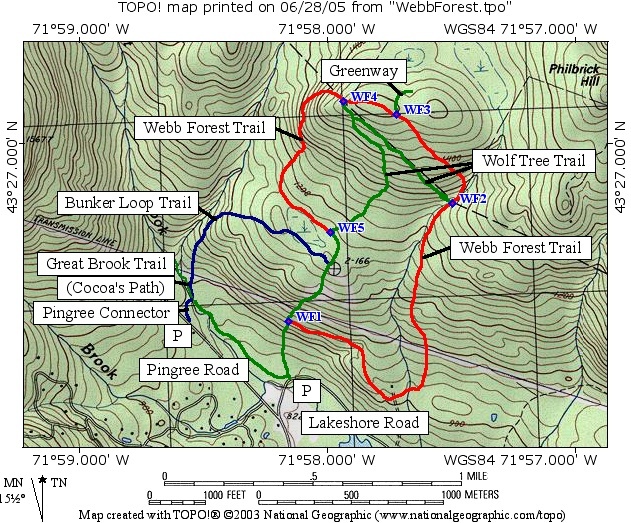 The Webb Forest Interpretive Trail (in red on map) starts at the intersection with the Wolf Tree Trail (SRKG trail in green at waypoint WF1) about 1/4 mile from Lakeshore Drive, then proceeds over to a knob with a view, crosses a woods road, then Sargent Brook and climbs 350 feet to a second intersection with the Wolf Tree Trail at the Wilmot - New London town line (WF2). The trail then becomes part of the SRKG in Wilmot and continues to climb another 220 feet until it separates from the Greenway (WF3). The trail continues on to New London (WF4) then descends 300 feet to its terminus on the Wolf Tree Trail (WF5). 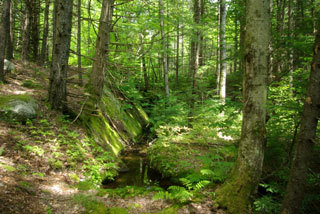 Several loops can be made in combination with the Wolf Tree Trail. The complete trail is 2.6 miles in length and a loop from the parking lot on Lakeshore Road (P) using the Wolf Tree Trail adds another 0.8 miles.